I have been building aerospace replicas for well over 50 years since I was a child. One of my earliest works at age nine was a 1/6 scale Mercury spacecraft for a GI Joe action figure fabricated out of lampshades! It has been an honor to have been an active contributor and consultant with the Smithsonian’s National Air and Space Museum (NASM) since 1995. My works there include a 1/34 scale Apollo 11 Saturn V with mobile launcher platform that was flyable, a large 1/48 scale replica of the secret Soviet N-1 moon rocket, and a NAVAHO nuclear cruise missile reproduction test vehicle from the 1950s. Recently installed in the National Air and Space Museum in Washington, D.C., are a full-sized copy of a secret spy satellite from the early 1960s, and a 1/4 scale model of the WorldView-3 satellite that was successfully launched into orbit in August 2014. The latest just completed projects were two 1/10 scale replicas of DigitalGlobe’s WorldView-3 satellite. One of these models was sold and went on permanent display at a national museum of mapping and cartography in Aguascalientes, Mexico. The other was sold to DigitalGlobe, Inc., and is on permanent display at their world headquarters in Denver, Colorado. As part of the traveling exhibit Destination: Moon, I was contracted by the NASM to build a 1/70 scale model of the Apollo 11 Saturn V rocket to show visitors the immense size and scale of the moon project. 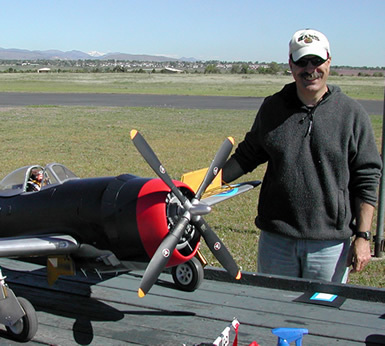 I have also built and flown large radio controlled aircraft that have won awards in competitions and are now in museums around the USA and in Europe. I have had a lifelong passion for aviation and spaceflight and made a career as an airline pilot for 36 years. Now recently retired, I am devoting my time to fulfilling customers’ requests for exciting new projects.